The current church building dates from medieval times and is categorised by CADW as ‘Grade I listed’ building because of its historical religious significance in this part of west Wales. The town of Aberystwyth, established as a borough by Edward I in 1277, was part of the extensive parish of Llanbadarn Fawr until the 1870s. The stone church was built after the Norman Conquest and before 1246, but has undergone significant changes over time. Serious faults in the roof and some supporting walls resulted in major renovation between the late 1860s and 1880s, designed and managed by John Pollard Seddon, FRIBA, a respected London-based Victorian architect who specialised in Gothic church interiors. Seddon’s plans for the interior of Llanbadarn Church called for impressive Gothic features and furniture that still remain in good condition today. J P Seddon contracted Jesse Rust of Battersea, London, who had become a well-known creator of different types of mosaics at that time, especially in public buildings in London and Manchester, to design this floor, having been impressed by his past works. 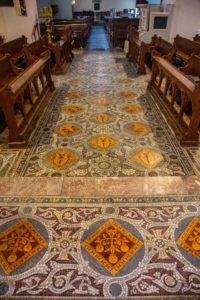 The mosaic floor Rust designed is beautifully patterned in designs of tiny 12.7mm (½ inch) tesserae that frame regularly placed encaustic tiles mainly depicting religious subjects. The mosaic floor lies directly on the Crossing under the bell tower, extending sideways into the north and south transepts and forward onto the marble Chancel step. Rust used recycled coloured glass and ceramic pigments to create a range of tiles and tesserae, which provided vivid, and attractive colours throughout. This floor is apparently unusual, because of the mix of image-bearing encaustic tiles within a glass mosaic surround. It is believed that the floor took some length of time before completion due to the intricate patterns of tesserae and it reached completion in the late 1870’s. Since its construction it has borne the footfall of continuous pedestrian traffic very well, although wear and grime over those years, the movement of objects over it, some very heavy, had taken its toll, and this had caused a fade in the tile colours. Also, heavy objects dragged and left on it, probably caused small tesserae pieces and in some places larger tesserae pieces becoming dislodged leaving a number of holes in the floor surface. 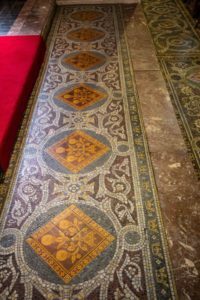 A thick carpet was fitted on the route from the western end of the nave of the church, and on to the high altar, and this placement undoubtedly did help to decrease the threat of further damage. This carpet remained in situ until 2014, when the interior of the church underwent a restoration, during which the interior walls of the church were repaired, re-plastered and painted, and a new gas central heating system was installed. The carpet was removed from the nave and part of the chancel exposing the mosaic floor for all to see. Rev Canon Andrew Loat, Priest in Charge of St Padarn’s Church made representation to the Parochial Church Council for the mosaic floor to be repaired and renovated, and this was approved in September 2015. A Diocesan faculty was granted, and a grant application to the Heritage Lottery fund was compiled and submitted in December 2017. The application was awarded for the work to be carried out in April 2018. 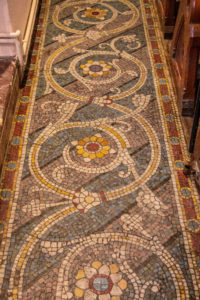 A firm of specialist mosaic contractors, The Mosaic Restoration Company from Daventry, Northhampton, were given the contract and work commenced in April 2019 when a full restoration and repair was carried out. The restoration and repair has now totally altered what was a low coloured and damaged area back to a condition that is as close as possible to when it was first constructed back in the 1870’s. Deep and vivid colours have now returned to the mosaic and the surface is level and secure. It forms a most attractive centre piece to the church that will remain for people to enjoy for many years to come. As a parish we are very grateful to Mr Brian Wiley for all his hard work and dedication in obtaining the grant required for the work to carried out. Thank you Brian. A FRESH WAY TO TALK ABOUT THINGS THAT MATTER. Faith Pictures is a fun six week course to help to talk about about our Christian faith naturally with other people. The course will be in English and will be on Tuesday mornings in St. Padarn’s Church Hall, Llanbadarn Fawr on Tuesday mornings between 10.45 and 12.00 on the following dates: 12.19 & 26 March and 2. 9 & 16 April 2019. The Course will be led by the Revd. Alun Evans. THE BIBLE COURSE – EXPLORE THE BIG STORY. AT: The Vicarage, Penrhyn-coch. Wednesday 2.30 pm. 13, 20, 27, March. 03, 10 April 2019. Do you want to go deeper into the Bible? Then the Bible Course is for you. It shows how the key books, famous characters and epic events form one BIG story, from Genesis to Revelation. The Course also provides tools and skills that help apply the Bible to everyday life. The Course is in English. Revd. Lyn Lewis Dafis (01970) 820162. lyndafis@gmail.com Visit: biblesociety.org.uk/thebiblecourse to find out more. A great time was had by younger and older in St. Padarn’s Church Hall on Saturday 23rd February 2019 as teddies and their owners “skied” on the slide and enjoyed songs, food, bubbles and prayers. The next youngsters’ event will be around Easter. It has become necessary for the foreseeable future to lock the Church earlier than usual because of some local problems – ANTI SOCIAL BEHAVIOUR by some young people. The Church will still be opened as from 08.45 daily (Morning Prayer said Monday – Friday). However it will usually be locked by 16.00 hours. If access is required please make arrangements with the Key Holders – Canon Andrew Loat, Priest in Charge or Keith Jones – details on Contact Page. A most enjoyable Social Evening was held on Saturday 16th February 2019 in the Church Hall. The “Murder Mystery” night was the brainchild of Meurig and Anna Lewis to raise funds for the Church. A fantastic amount of work went into making it such a wonderful evening which was very well attended. The brilliant actors were all local with Church connections and performed superbly. The first scene was followed by a lovely cold meal, beautifully prepared by local volunteers. The second scene was followed by the Sweet course. That in turn was followed by the final scene when the truth was revealed. The evening concluded after the drawing of the Raffle. Heartfelt thanks were given by the Vicar to all who had helped in any way to make the evening such a fantastic success: The Actors, all who had helped prepare the hall, all who had bought and prepared the food and those who served it and cleared and washed up, those who sold and bought the tickets and those who had supplied equipment of any sort. The voluntary work of so many people contributed in no small way in helping to raising funds for St. Padarn’s Church. Revd. Lynn Rees (Non Stipendiary Curate). The Revd. Lynn Rees presided and preached at the 11.15 Sung Eucharist on the 4th Sunday of Advent 2018 in St. Padarn’s and told the congregation that this would be his final Service with us as the Bishop had appointed him to a new post as Stipendiary Curate in the Parish of Betws St. David with Ammanford from the beginning of 2019. Lynn said thank you to everyone for their kindness and support. On behalf of the congregation, Keith Jones, Licensed Reader, thanked Lynn for all his work in the Parish , Group and Local Ministry Area and wished him every blessing in his new Ministry. Annual Service of 9 Lessons and Carols – 2018. The Annual Service of 9 Lessons and Carols led by the Choir was held on the 3rd Sunday of Advent, Sunday 16th December 2018 at 11.15. The Vicar, the Revd. Canon Andrew Loat presided. At the beginning of the Service, the Choir processed from the Font following the Processional Cross, during the singing of the Hymn “O Come, O Come Emmanuel”. The Congregation joined with the Choir in singing the various Carols. However, the Ave Maria, music by Jacob Arcadelt (1505-1568) arranged by Alan Ridout, was beautifully sung by the Choir alone. The singing was interspersed by Readings from Scripture read by Choristers and members of the congregation. Following the reading of the 9th Lesson, the concluding Carol was “O come all ye Faithful” together with Descant after which the Vicar pronounced the Blessing. Mr Ian Rees was at the Organ and the Choir were led by the acting Choir Master, Keith Jones. A United Service of Remembrance on the 100th Anniversary of the end of World War 1 was held in St. Padarn’s Church to remember all who gave their lives in 2 World Wars and many subsequent conflicts and to pray for peace in our world today. The Service was led by the Revd. Canon Andrew Loat, Priest in Charge, assisted by the Revd. Lynn Rees. Mr Ian Rees was at the Organ. The Roll of Honour was read by Councillor Duncan Tibbit on behalf of Cyngor Cymuned Faenor Community Council. The Church Bells were rung before the Service by the Ringing Team. Following the Blessing from Canon Loat, the Congregation walked to the Village War Memorial led by the Clergy and the Church Choir. Following prayers and the Last Post played by Bugler Aidan Hassan, Two Minutes Silence was observed. Then followed the Reveille and the laying of Wreaths, the Kohima Epitaph and the Prayer of St. Francis of Assisi. The Service concluded after the Blessing. The Rite of Confirmation for the Bro Padarn Local Ministry Area was administered at Hafod Church on Sunday 4th November 2018 by Bishop Joanna. 17 people from all over our Local Ministry Area, which stretches from Eglwysfach to Hafod, came to be confirmed, including 2 from Capel Bangor & 5 from Penrhyn-coch. A bilingual Choral Evensong was held at 4 p.m. on Sunday 14th October to celebrate the annual Harvest Festival. The Revd. Canon Andrew Loat, Priest in Charge officiated and the guest preacher was the Revd. Julian Smith, Vicar of the Llanrhystud Group of Parishes and father of one of our team of Organists. Mr Ian Rees was at the Organ and the Choir was led by the acting Choirmaster, Keith Jones. A bring and share tea followed in the Church Hall which was much enjoyed by all who attended. Many thanks are due to the Revd Julian Smith for his address, also to all who provided the delicious food and to all who organised the hall and assisted by making and serving tea and who provided kitchen services. 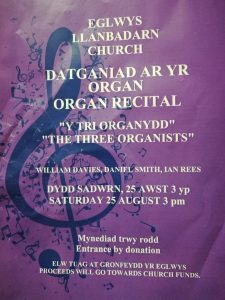 On a beautiful August afternoon, a well attended Organ Recital was held in St. Padarn’s Church, Llanbadarn Fawr at which three Organists played some very beautiful music. The 3 Organists, 2 of whom are quite young and who all play for Sunday Morning Services, dished up a feast of music. William Davies was first at the Organ followed by Daniel Smith and then by their teacher, Ian Rees. The afternoon concluded with Daniel Smith back again at the Organ. The sustained applause at the conclusion of the Recital was proof positive of the audiences appreciation of such a wonderful afternoon of Organ music provided so efficiently by all three Organists to raise funds for the Church. A Memorial Service for the Reverend Canon William H. Watkins was held at St. Padarn’s Church, Llanbadarn Fawr on Thursday 2nd August 2018 following a private committal Service at Aberystwyth Crematorium . The Memorial Service was led by the Revd. Canon Andrew Loat, Priest in Charge with a Scripture reading by the Revd. Canon Roger Jones. A Service of welcome to the Local Ministry Area of Bro Padarn was held in St. Padarn’s Church on Thursday evening 5th July to celebrate the new Ministry amongst us of the Reverend Alun John Evans who came to us to continue his curacy after spending 2 years as a Curate in the United Benefice of Haverfordwest. Alun, who was licensed by Bishop Joanna to the Benefice of Llanbadarn Fawr & Elerch & Penrhyn-coch & Capel Bangor and installed by Archdeacon Will Strange, joined the Local Ministry Team led by the Team Leader, Canon Andrew Loat, Priest in Charge of Llanbadarn Fawr and Elerch and Penrhyn-coch and Capel Bangor. 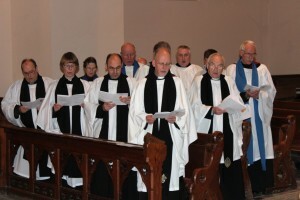 The Choral Service, with Mr Ian Rees at the Organ, began with a Procession led by the Crucifer and Choir of St. Padarn’s, the Local Ministry Team (Ordained and Lay) and a considerable number of visiting Clerics, followed by the Archdeacon of Cardigan, the Venerable Dr. Will Strange and Bishop Joanna and her Chaplains. Bishop Joanna preached and Alun was welcomed by various representatives of the Churches in the Ministry Area. After the Blessing from the Bishop, the Service concluded with the Recessional Hymn. Light refreshments were then enjoyed in the Church Hall by the visitors and locals who had come to offer their support. We wish Alun and his wife Becky every blessing as they begin their new life amongst us. 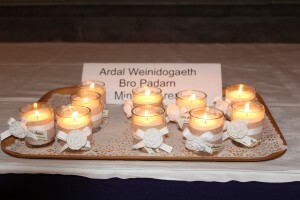 Feast of St. Padarn – Roman Catholic Brothers and Sisters. 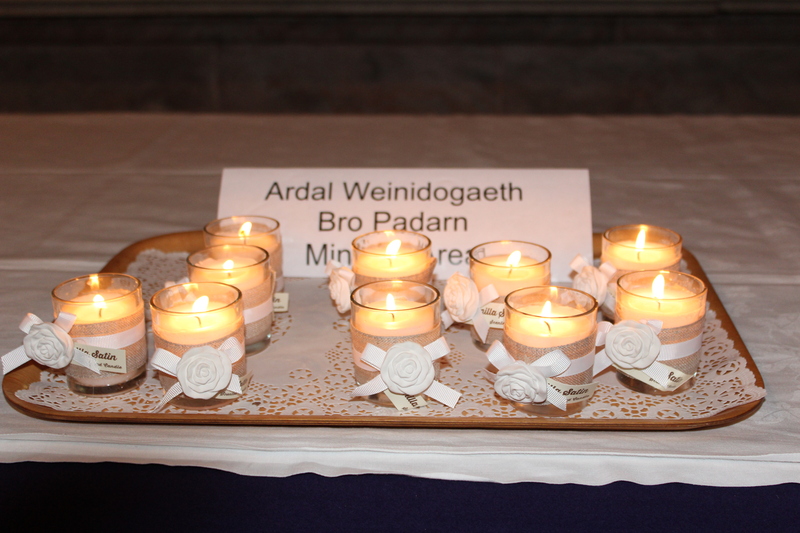 A Welsh Mass was held in St. Padarn’s on the Feast Day, Sunday 15th April, organised by the Cylch Catholig and Gweithgor Padarn Sant. The Choral Service began at 4 p.m. at which the Revd Father Allan Jones presided and preached. As well as the Roman Catholic congregation, a number of Anglicans were also in attendance to enjoy the fellowship and the excellent singing. Refreshments were provided in the Black Lion following the Service. Members of all the Churches in the Benefice were invited to the Swinging 60’s Social which was held in Llanbadarn Fawr Church Hall on Saturday afternoon, 27th January, to which admission was free. Members of St. John’s, Penrhyn-coch decorated the Hall brilliantly in readiness for the Social. Members of St. Padarn’s were responsible for obtaining and cooking the meal 60’s style, with members of St. David’s, Capel Bangor responsible for serving the food. Fancy dress was optional and a lovely afternoon together was very much enjoyed by all who were able to attend with a 60’s Raffle, 60’s Quiz, pass the parcel and 60’s songs. Julie and Sarah led the singing with the 60’s style songs. The Vicar expressed his thanks to all who helped organise such a wonderful “get together” and all who attended and contributed in any way. The generosity of Morrison’s, Tesco, Marks and Spencer and Mollie’s is greatly appreciated. On Saturday 24th June 2017, the Feast of the Nativity of St. John the Baptist, our Deacon, the Revd. Lynn Rees was ordained Priest by Bishop Joanna in our Cathedral Church at St. Davids and will continue to serve as a Non Stipendiary Assistant Curate in the Grouped Parishes of Llanbadarn Fawr and Elerch and Penrhyn-coch and Capel Bangor and the Bro Padarn Local Ministry Area. Please pray for Lynn as he enters his new Ministry. A Roman Catholic Mass in the Welsh language was celebrated in St Padarn’s on Saturday 22 April 2017. The Chief Celebrant was the Bishop Emeritus of Wrexham, the Right Reverend Edwin Regan. The Bishop of Menevia, the Right Reverend Tom Burns was in attendance. 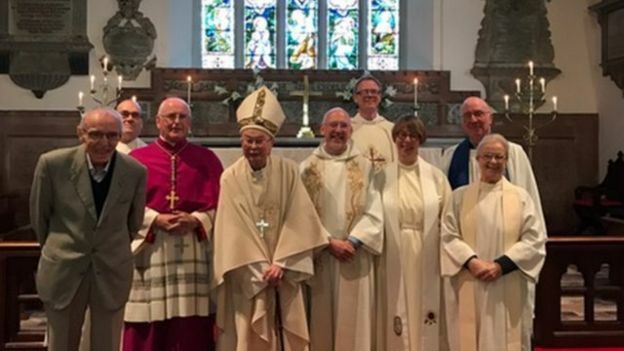 The Anglican Priest in Charge of the Llanbadarn Group of Parishes, the Reverend Canon Andrew Loat and other members of the Ministry Team, Ordained and Lay, were also present. The journey of a senior librarian who left his job to become a priest was followed in a radio feature at the end of August 2016. Lyn Lewis Dafis resigned from the National Library of Wales after 25 years to return to student life and train as a priest at St Michael’s College, Cardiff. He now serves as an assistant curate in this Grouped Benefice of Llanbadarn Fawr and Elerch and Penrhyn-coch and Capel Bangor. His story was told on Sunday morning 28.08.2016 on Radio Cymru’s Bwrw Golwg programme. The presenter, John Roberts, followed Lyn for a year, from his emotional ordination as a deacon in 2015 to his ordination as a priest. Five years ago Lyn had begun to feel he was being called to do more than serve the church as a licensed Lay Reader. He has faced many changes and challenges along the way – learning Hebrew, re-learning to drive, learning to trust that God would help him find the right words when parishioners came to him for advice. On Saturday 25th June 2016, our Deacon, the Revd. 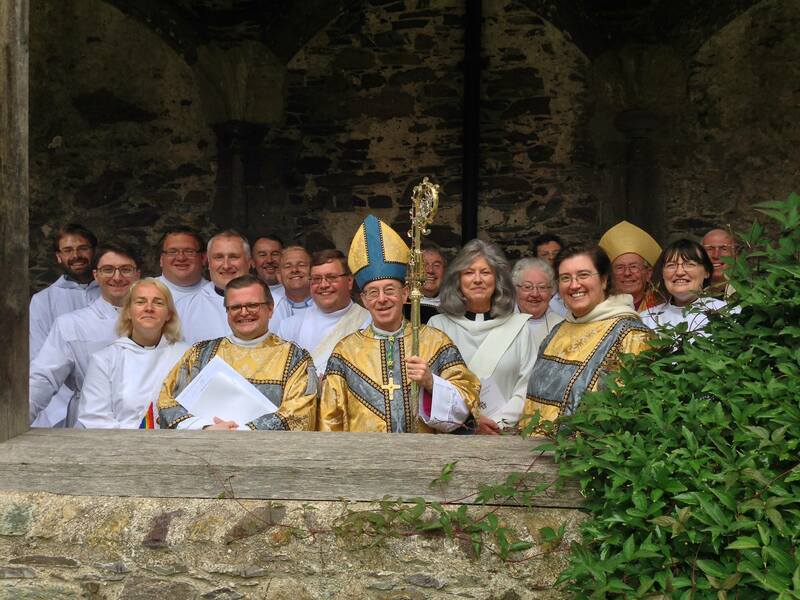 Lyn Lewis Dafis was ordained Priest by Bishop Wyn in our Cathedral Church at St. Davids and will continue to serve as a Stipendiary Assistant Curate in the Grouped Parishes of Llanbadarn Fawr and Elerch and Penrhyn-coch and Capel Bangor and the Bro Padarn Local Ministry Area. On Sunday 26th June 2016, also in our Cathedral Church, Mr Lynn Rees was ordained Deacon by Bishop Wyn to serve as a Non Stipendiary Assistant Curate, also in the Llanbadarn Group of Parishes and the Bro Padarn LMA. Please pray for both these men as they enter their new Ministries. On the evening of Sunday 26th June 2016 at 6.30 p.m. in St. John’s Penrhyn-coch, St. Padarn’s Church Choir was present at a well attended bilingual Celebration of the Holy Eucharist as Lyn and Lynn began their new Ministries. The Revd. Lyn Dafis celebrated the Eucharist for the first time assisted by the Revd. Lynn Rees. Our Parish Priest, the Revd. Andrew Loat preached and the Revd. Heather Evans led the Intercessions. Following the Service, lovely refreshments were enjoyed in the Church Hall when Lyn & Lynn were invited to cut a cake to celebrate their respective Ordinations. Congratulations and best wishes to the Revd Andrew Loat and the Revd Heather Evans whose marriage took place at St. Padarn’s Church, Llanbadarn Fawr on Saturday 9th April 2016 . The Venerable Hywel Jones presided, the Preacher was the Revd Canon Rhiannon Johnson and Mr Stephen Loat was the Best Man . 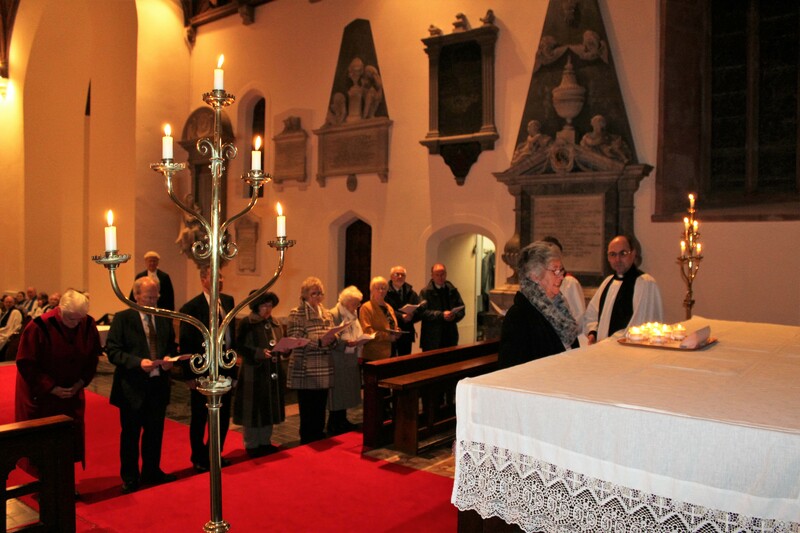 On Monday evening 7th March 2016 at a special service in St. Padarn’s Church, the latest Local Ministry Area in St. David’s Diocese was established. Bishop Wyn presided at the inauguration and he was assisted by the Archdeacon of Cardigan – the Venerable Dr . Will Strange, the acting Area Dean – the Revd. Peter Jones and the Bishop’s Chaplain – the Revd. Canon Paul Mackness. Representatives of ten Churches from three Benefices laid candles on the Altar and then signed a Covenant Agreement in the presence of the Diocesan Registrar, Mr Anthony Jenkins, thereby agreeing to work more closely together. The Newly Formed Bro Padarn Ministry Area will move forward under the leadership of the newly commissioned Ministry Team Leader, the Revd Andrew Loat – Priest in Charge of Llanbadarn Fawr & Elerch & Penrhyn-coch & Capel Bangor. The other Churches in the new Ministry Area are Llangorwen, Llanfihangel Genau’r Glyn & Talybont and Borth, Eglwysfach & Llangynfelin. Stipendiary Clerics, Non Stipendiary Clerics, Retired Clerics and Licensed Readers (Lay Ministers) also signed an agreement to work together as part of the new Ministry Team. SUNG MATINS – SUNDAY 15th NOVEMBER 2015. The 11.15 service of Morning Prayer was led by the Vicar, the Revd. Andrew Loat with the Curate, the Revd. Lyn Dafis also present. The Preacher was Mr Keith Jones, a long serving Reader in the Parish who had received his Licence to preach in the Diocese of St. Davids 30 years ago on 13th November 1985 in St. Padarn’s Church, from the then Diocesan Bishop, the Right Reverend George Noakes. Keith has since preached in most of the Churches in the Deanery of Llanbadarn Fawr. During his sermon, Keith stated that he was a member of that little known Fan Club, the St. Luke Fan Club and explained how St. Luke had inspired many of his sermons. Following the Sermon, the Vicar thanked Keith for his loyal service as a Reader over the past 30 years and surprised him by presenting him with some gifts from the Parishioners, for which Keith was most grateful. Following the installation of a new heating system and the re-decorating of the Church, it was necessary to have a new carpet in the Lady Chapel. This lovely carpet has now been installed and has greatly enhanced the appearance of the Chapel. We are most grateful to those who contributed to the considerable cost, including donations given in memory of the late Ivor and Winifred Williams and the late Reverend Canon Geraint Vaughan Jones. 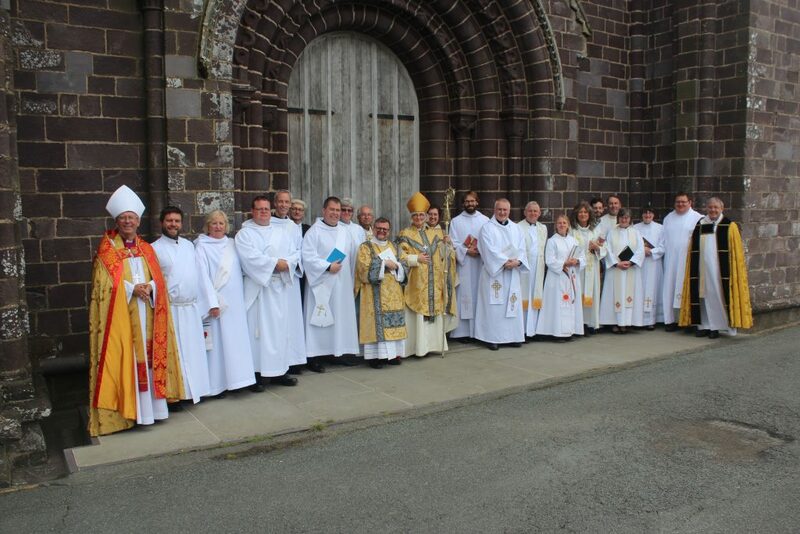 On Saturday 27th June 2015 – Petertide, the Reverend Heather Evans, who was ordained Deacon in September 2014 and currently serving as a Non Stipendiary Minister (Local) in this Grouped Benefice of Llanbadarn Fawr and Elerch and Penrhyncoch and Capel Bangor, was ordained Priest by Bishop Wyn in our Cathedral Church at St. David’s. 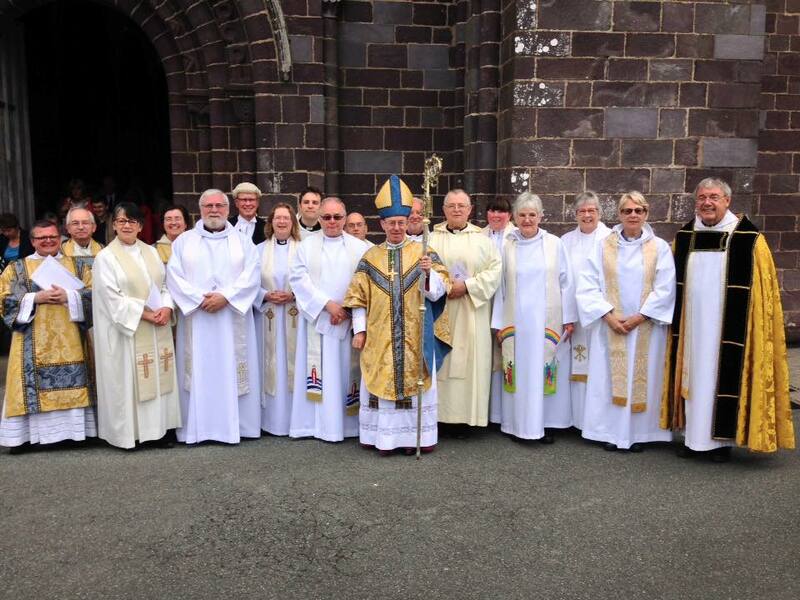 On Sunday 28th June 2015, Mr Lyn Lewis Dafis was ordained Deacon and will serve his title as a stipendiary (full time – paid) Curate in this Group of Parishes. Lyn has for many years served as a Licensed Reader in this Deanery, based at St. Mary’s Church in the Rectorial Benefice of Aberystwyth. Both Curates will be working as part of our Ministry Team under the supervision of the Reverend Andrew Loat, our Vicar. Following the administration at the Sung Eucharist on Sunday 14th June 2015, the Vicar the Revd. Andrew Loat, presented Noel with a Photograph of the Starlings over Aberystwyth Pier to remind him of his time amongst us and warmly thanked him for his work in the Parish and more recently the Group and wished him well for the future, as this was Noel’s last service before returning to his native New Zealand. About 18 months ago, Bishop Wyn decided that he wanted to visit every Parish in this large Diocese of St. Davids before he retires. As he continued on his journey, on Thursday 28th May 2015, accompanied by his Chaplain, the Revd. Canon Paul Mackness, the Bishop spent the day in this Group of Parishes. The day began at St. Padarn’s at 09.30 with bilingual Morning Prayer, led by the Reader, Keith Jones. That Service, in the Lady Chapel, concluded with Bishop Wyn blessing all present. The Bishop then joined with members of the Ministry Team at the Vicarage for refreshments. At Noon, Bishop Wyn, assisted by the Vicar, the Revd. Andrew Loat and the Curate, the Revd. Heather Evans celebrated the Holy Communion at a bilingual service at St. Peter’s Church, Elerch. Following lunch with some members of the ministry team and other parishioners at a location in Capel Bangor, an act of public worship was held in St. David’s Church in the village, led by the Revd. Heather Evans. The Bishop and some members of the Ministry Team then paid a visit to the Hydro Electric Power Station at Cwm Rheidol and had a conducted tour of the Station. The day concluded at 17.00 hours with bilingual Evening Prayer at the Church of St. John the Divine at Penrhyncoch led by the Vicar. The Bishop blessed all present before light refreshments were enjoyed by all. On Sunday 15th February 2015, we were very glad to welcome our Diocesan Bishop, the Right Reverend Wyn Evans, Bishop of St. Davids to this ancient Church to administer the rites of Holy Baptism and Confirmation in the setting of the Holy Eucharist which he celebrated bilingually. 18 young men and women committed their lives to Jesus and were Confirmed by Bishop Wyn after he had Baptised of one of their number. One young person from Holy Trinity Church in the Rectorial Benefice of Aberystwyth joined the 13 from St. Padarn’s, 2 from Penrhyncoch and 2 from Capel Bangor all in this Grouped Benefice, for a joyous choral service and made their first Communion in this holy place where Christians have worshipped since the 6th Century. Bishop Wyn has appointed the Revd Andrew Loat, Rector of the Upper Ithon Valley and Lower Ithon Valley Group Benefices, Canon of Brecon Cathedral and Area Dean of the Maelienyddd Deanery in the Diocese of Swansea and Brecon, as Priest in Charge of this Group. On Thursday 8th May 2014, the Reverend Andrew Loat was Licensed as Priest in Charge of Llanbadarn Fawr & Elerch & Penrhyncoch & Capel Bangor at a service in St. Padarn’s Church, Llanbadarn Fawr. 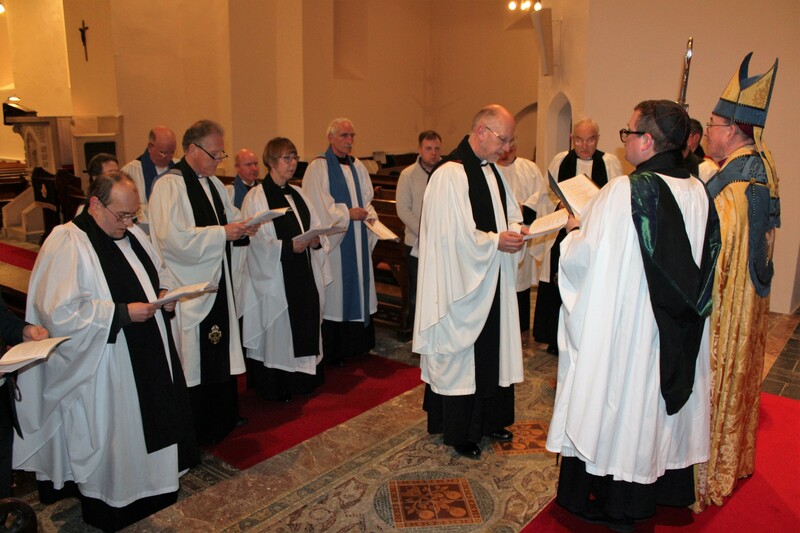 Bishop Wyn presided, assisted by the Archdeacon of Cardigan – the Venerable Dr. Will Strange and the acting Area Dean of Llanbadarn Fawr Deanery – the Reverend Canon Stuart Bell. The Revd. Brian Griffith M.Th.——Andrew writes: Many worshippers in St. Padarn’s will have learnt with sadness of the death of the Reverend Brian Griffith, whose funeral took place in Llanychaearn on Friday 4th July 2014. Brian was ordained in 1982 at the same time as Andy Herrick by Bishop (later Archbishop) George Noakes. 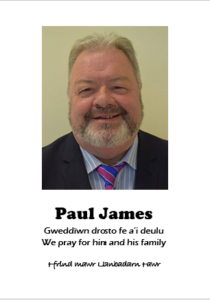 From 1988-93 he served as NSM priest in Llanbadarn and Capel Bangor, continuing to assist Hywel Jones when the latter moved to Llanychaearn parish having been made Archdeacon. This enabled him to attend worship with his wife, Betty. In retirement Brian continued to help in Llanbadarn with the celebration of saints’ days and the 8 o’clock service on Sundays during the interregnum, although ill health forced him to give these up about eighteen months ago. He is survived by Betty and their two daughters. May he rest in peace and rise in glory. The Church Shop has been open now at the back of the Church since the last day of June 2009. It is staffed on Sunday mornings and sells small gifts and various greeting cards in both the Welsh and English Languages. Any profit goes to help Church funds. The Shop team reports that the church shop continues to do a steady trade and we are grateful to those who purchase items from it. As well as cards and gifts there are also a variety of other items, including books and 2nd hand jewellery. Some cards etc have a picture of our church and are intended as a memento of a visit here by holiday-makers but we still need our own parishioners’ support to help give a steady income throughout the year. Please do come and browse before or after Sunday services and during the week purchases can be made with the payment left in the box provided. Any items you may be able to donate for sale e.g. new, unwanted gifts or books in good condition, would be gratefully received by those staffing the shop – Cherry, Pip and Joan. Don’t forget to have a browse in the Shop next time you come to Church. The Card or Gift you have been looking for may be here. The members of St. Padarn’s Church wish to thank the Organisations listed below and acknowledge the generous financial support given by them to help us carry out this major refurbishment work in the Church Hall. Ceredigion County Council: Aberystwyth Business Club: The Fronhaul (Llandinam) Charity: The James Pantyfedwen Foundation: The Llanbadarn Community Association and the Park Lodge Hotel.